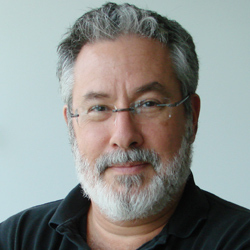 Larry Birnbaum's research and teaching focus on applied Artificial Intelligence, natural language processing (NLP), social media analytics, and contextual search, with applications to media and journalism. A key focus is on methods for the automatic generation of content by machine, including specifically the automatic generation of narratives from data. Another important area of Larry's research is intelligent information systems, including models of automatic and contextual search and information diversity. A third focus is on preference predication and recommendation using social media data. More generally, projects in Larry's lab are aimed at automating and supporting all aspects of the "content pipeline," including research, content generation, content distribution, and user interaction with content. Johnson, C., Birnbaum, L., Bareiss, R., and Hinrichs, T. War stories: Harnessing organizational memories to support task performance. ACM Intelligence, vol. 11, 2000, pp. 16-31. Budzik, J., Hammond, K., and Birnbaum, L. Information access in context. Knowledge-Based Systems, vol. 14, 2001, pp. 37-53. Liu, J., Wagner, E., and Birnbaum, L. Compare&Contrast: Using the web to discover comparable cases for news stories. Proceedings of the 16th International World Wide Web Conference, Banff, Canada, 2007, pp. 541-550. Liu, J., and Birnbaum, L. What do they think? Aggregating local views about news events and topics. Proceedings of the 17th International World Wide Web Conference, Beijing, China, 2008. Liu, J., Birnbaum, L., and Pardo, B. Spectrum: Retrieving different points of view from the blogosphere. Proceedings of the Third International Conference on Weblogs and Social Media, San Jose, CA, 2009. Allen, N., Templon, J., McNally, P., Birnbaum, L., and Hammond, K. Statsmonkey: Automatic generation of narrative from data. Computational Models of Narrative: Papers from the 2010 AAAI Fall Symposium, Arlington, VA, 2010. O’Banion, S., Birnbaum, L., and Bradley, S. Finding the local angle in national news. Proceedings of the 2013 International Conference on Intelligent User Interfaces, Santa Monica, CA, 2013. Cohn, J., Kuntz, A, and Birnbaum, L. AttitudeBuzz: Using social media data to localize complex attitudes. Proceedings of the 2015 IEEE/ACM International Conference on Advances in Social Networks Analysis and Mining, Paris, France, 2015.